Explore the Science behind Superheroes at Marvel’s Avengers S.T.A.T.I.O.N. Singapore + GIVEAWAY! If you have an Avengers fan at home, then the Marvel’s Avengers S.T.A.T.I.O.N. exhibition at Science Centre Singapore is a dream come true. But more than just showcasing superheroes, it is an exhibition that imparts the science that makes superheroes possible. What kind of serum turned Captain America into a superhuman? Why is the Hulk green? Is Artificial Intelligence capable of creating an Ultron in the real world? Very geeky questions no doubt, but the answers derived from the science, technology, engineering and mathematics perspectives involving the Avengers' superpowers are what make the exhibition fun and informative. The exhibition debuted in New York in 2014 and has since conducted successful runs in Seoul, Paris and Las Vegas. And great news, this Singapore edition is the largest one yet as it includes original costumes and props from films as recent as Captain America: Civil War! 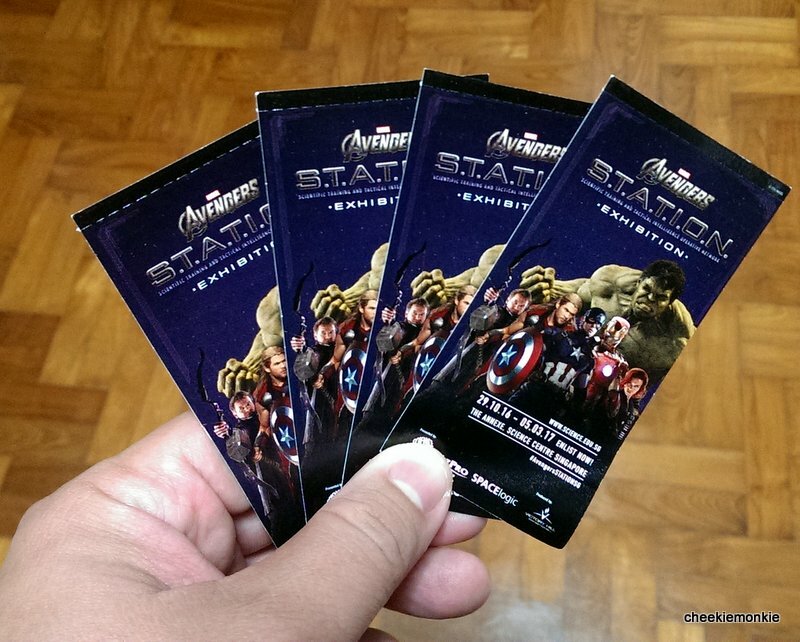 If you are planning to head down, first things first - download the 'AVENGERS S.T.A.T.I.O.N.' Application from the App Store (Apple) or Play Store (Android) on your mobile device before entering the exhibition. If you do not have a mobile device, you can rent a device for S$5. A photo ID or passport will be required as deposit. Don’t forget to run the app at home first as there is some additional data to download before everything is good to go. The app comes with audio from Agent Maria Hill herself, including quizzes along the various stations, as well as taking photos with your favourite Avengers. Captain America, the leader of the Avengers, is naturally where everything begins. Here, the physiological effects of the "Super Soldier Serum" injected into him are explained with respect to the various parts of the brain, complete with props like his shield, costume and bike! Along the way, you will have to answer questions relating to the exhibits in order to move onto the next section. Kids who wish to get hands-on can head over to the High Performance Test Area where they can pit your strength against Captain America. For the record, nobody has topped him yet. Need more strength? Maybe a little gamma radiation might help. Inside Dr Bruce Banner's bio-lab, kids will be able to learn exactly what made the Hulk turn green, including the psychological mechanisms of the Hulk’s brain when he transforms. Kids will also be able to interact with a digital Hulk.... just try not to make him too angry. The Tesseract portal was a welcome surprise. The boys were able to identify it almost immediately, which was expected given that they had watched and re-watched and re-watched Avengers and Avengers 2 so many times. Informative panels and costumes comprising of other Avengers like Black Widow, Hawkeye, Falcon and Ant-Man were on display too. Over at Thor's Observatory, kids can peer peer into the galaxy and visit faraway planets to discover Asgard, home of Thor. Oh, and there is also the tiny matter of trying to lift Thor's hammer at the Mjölnir Simulation section. Us mere mortals tried but were all deemed unworthy. LOL. It wouldn't be Avengers if Iron Man is not part of the exhibition. And in true Tony Stark's style, the Iron Man area is the largest scale of the lot. Apart from the 3m-tall Hulkbuster, the Mark 46 suit worn by Iron Man in Captain America: Civil War, War Machine's exosuit are on display - alongside Tony Stark's Hall of Armour... including Mark I, the first Iron Man suit! A pity that there wasn't a chance for visitors to get into one of Iron Man's suits. But at least we got to suit up via augmented reality. That was Ale, who made Iron Man look as if he was break dancing. The Avengers experience concluded with an epic battle with Ultron in an interactive touchscreen game, together with other fellow visitors. For the record, Ultron was blown to smithereens. At the end of the exhibition, kids can also try out some hands-on craft work to make their own Avengers souvenirs. Choose from Shrinking Heroes, Foam Colouring or Flying Superheroes, all priced at $5 each. I love how the exhibition has taken the superhero genre and curated it around principles of S.T.E.M. That is Science, Technology, Engineering and Mathematics (NOT magic) in case you are wondering. Rather than just a showcase of superheroes and their costumes, it is extremely scientifically educational which makes it a perfect place to bring the kids. There is a fair amount of reading to be down at all the sections so parents might need to explain certain information to younger kids. My final tip? Take your time and do not rush through the exhibits! Planning to bring the kiddos? I have FOUR Marvel’s Avengers S.T.A.T.I.O.N. tickets to give away to one lucky family! Congrats to PHIL ZHUANG! You have won FOUR Marvel’s Avengers S.T.A.T.I.O.N. tickets! Please email me at kelvin@cheekiemonkie.net for prize collection details. Thanks! To participate, simply leave comment and tell us which is your favourite Avenger. Leave your response either in the corresponding Facebook post HERE or in this blog post. Giveaway ends on 15 Feb 2017, 2359 hours. It has to be Ironman as he uses so many cool high technology stuff. My favorite character is ironman as he is the man robot i ever see. He got great powers and can fly around. How nice i can be like him so i can save people and can just fly around without taking transport and plane. My whole family favourite. My favorite Avengers is Captain American as he is very loyal to his love, his country and his belief. Nothing can stand in his way if he belief it is the way to get things done. Iron man. Because he can iron without holding one. Iron man. He has the strongest superpower called "extreme wealth". Just kidding. I meant intelligence. Definitely Captain America as that was the first figurine that I bought for my son to praise him for being so brave in facing his fear .. and til now, my son still fondly play with the figurine that I gave him years ago ..
My favourite character has got to be Captain America!! You have to love the values that he brings, never be defeated and even if you fall, get back on your feet and try again or as he often says: I can do this all day!!! Go Captain!!!! Love, love Ironman! I still have the phone cover from 7-eleven.